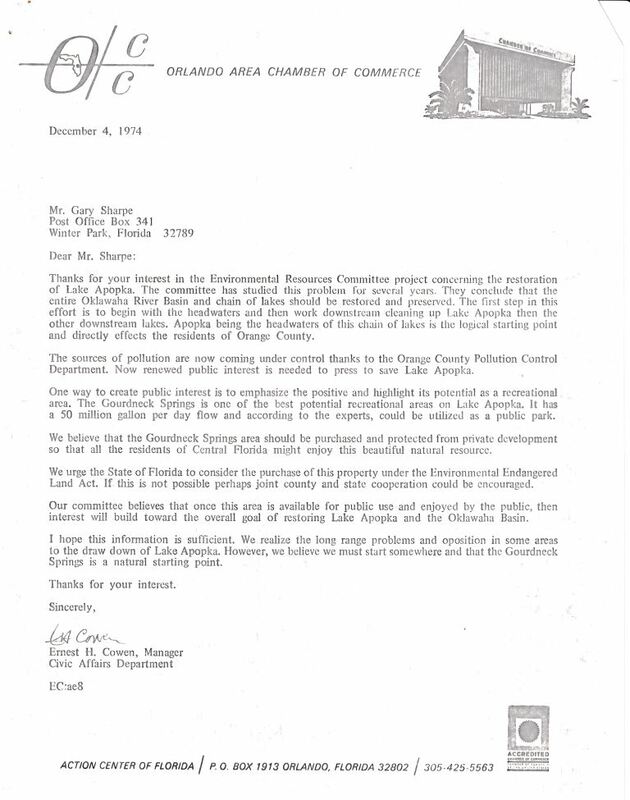 This letter, from Ernest H. Cowen, Manager of the Orlando Area Chamber of Commerce's Civic Affairs Department, to Gary Sharp, states Cowen's belief that a park in the Gourd Neck area would help attract public support for the larger project of restoring Lake Apopka and the Oklawaha River Basin, by emphasizing the area's suitability for recreational use. Cowen states that Environmental Resources Committee of the Orlando Chamber also supports this potential project. Cowen urges that the State of Florida purchase the land using funds from the Environmental Endangered Lands Program. Gourd Neck Springs is a small spring located in the southwest portion of Lake Apopka, in a small cove called “Gourd Neck” due to its distinctive shape. This area of the lake was considered in the 1960s as a potential nursery for fish. The Lake Apopka Technical Committee explored damming the Gourd Neck, separating it from the lake and preventing polluted lake water from entering, but these plans did not materialize. Efforts were also made in the 1960s to have the Gourd Neck area purchased by the State of Florida for use as a public park. The Gourd Neck Springs Park Association was formed in 1961 to study the site’s potential for a park and lobby for support from legislators. The land bordering the area was privately-owned by various individuals. One of these, Gary Sharp, continued seeking support for a park into the 1970s. While the project received support from Florida legislators and environmentalists, the land was never purchased by the state. The Environmental Endangered Lands Program (EEL) was formed in 1972 as part of the larger Land Conservation Act of 1972. The EEL program was initially funded through the sale of state bonds. The program was designed to help the state acquire lands considered Environmental sensitive and was not designed for creating areas for recreational use. Potential sites for acquisition could be suggested by citizens, county and state governments, and non-profit organizations. After evaluation for Environmental value, potential sites would be approved by the Executive Director of the Florida Department of Natural Resources and finalized by the Governor. In 1979, the former Executive Director, Harmon Shields, was indicted on corruption charges involving the lands-acquisition process. Following this scandal, the EEL program was replaced by Conservation and Recreation Lands Program. This change replaced the program's funding with tax revenues instead of bond sales, and formed the Land Acquisition Selection Committee, made up by six executive directors of Florida Environmental agencies, to select sites for approval by the governor. The Division of State Lands was also created as a division of the Department of Natural Resources to over-see mapping and evaluation of potential sites for acquisition. Photocopy of original 1-page typewritten letter from Ernest H. Cowen to Gary Sharp, December 4, 1974: binder 1974, Friends of Lake Apopka Archives, Ginn Museum, Oakland Nature Preserve, Oakland, Florida. Digital reproduction of photocopied 1-page typewritten letter from Ernest H. Cowen to Gary Sharp, December 4, 1974. Binder 1974, Friends of Lake Apopka Archives, Ginn Museum, Oakland Nature Preserve, Oakland, Florida. Originally created by Ernest H. Cowen. "Harmon Shields Indicted." The Boca Raton News, May 2, 1980. Accessed June 14, 2016. https://news.google.com/newspapers?nid=1291&dat=19800502&id=IB5UAAAAIBAJ&sjid=mI0DAAAAIBAJ&pg=3814,204016&hl=en. Farr, James A., and O. Greg Brock. "Florida's Landmark Programs for Conservation and Recreation Land Acquisition." Sustain 14 (2006). Accessed June 14, 2016. http://www.dep.state.fl.us/lands/files/Florida_LandAcquisition.pdf. 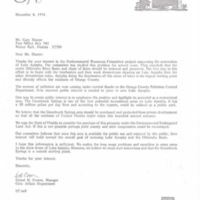 Cowen, Ernest H.. “Letter from Ernest H. Cowen to Gary Sharp (December 4, 1974).” RICHES of Central Florida accessed April 25, 2019, https://richesmi.cah.ucf.edu/omeka/items/show/7541.